UX is short for User Experience Design and since most transmedia projects are designed to create an interactive experience with the audience, you’d think transmedia would have UX nailed. 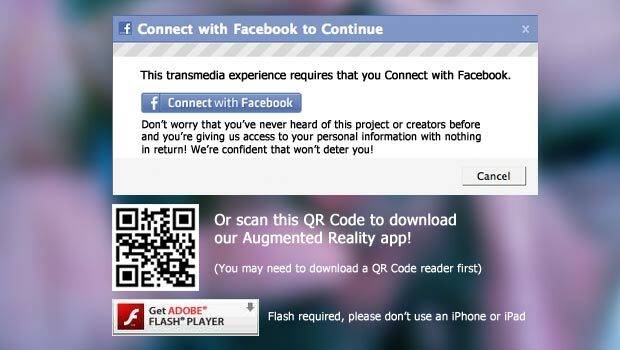 Instead, I often find my first contact with a transmedia project becomes a stumbling block because of poor UX. Maybe it requires me to login with Facebook without giving me a reason why or starts too deeply into an invented mythology or it makes assumptions that I am already an ardent fan so no effort is made to sell me on the story. How do I ease people into the experience? When you open an app or game for the first time, there is often a process known as on-boarding. It’s how developers reinforce the value of the app and introduce the mechanics of using it. Lots of games do this well by letting you start playing right away and give tips like “tap and hold to fly.” You get a feeling of the game while learning how to play in a forgiving environment. It eases frustration, which retains users longer. You’ve probably seen bad examples of on-boarding when you download a simple app but then you launch and the screen is overtaken by a simulated chalkboard drawing explaining every button, feature, and sharing option. Or an app that requires you to swipe through confusing tutorial screens before you can even see the app. Transmedia projects can learn from this user on-boarding process even if the project doesn’t have an app or game. Whether your entry point is a video, parallax website, or something totally different, try to make it simple for a user to get past the first story hurdle and then clearly explain what the next step is. Maybe the interactive structure of your project isn’t linear, but be sure to recommend a linear path for people who expect it or you’ll risk losing them. Fans may love to explore the transmedia universe of Pixar, Marvel, and Disney, but that’s because they’re already connected to the characters and stories. Don’t expect users to be eager to explore your world until you give them a connection to your characters and story. What’s the right way to talk to my users? You may have spent months scripting scenes or writing choose your own adventure stories. Put the same effort into choosing the words you use to communicate with your users. This will be related to the tone of your narrative, but that doesn’t necessarily mean it’s the same tone as your narrative. Imagine that your project itself is a character with its own voice. It’s the voice telling users where to sign up, download, submit forms, swipe screens, and do all the things that aren’t part of the narrative but that hold the narrative pieces together. You put lots of thought and effort into creating a transmedia narrative that spans platforms in a new and creative way. Don’t forget to study examples of great UX for each platform your story is told on, as well as thinking through UX for the larger framework of your transmedia project.